The Givens Grove > DIY Projects > Saw Dust Baby! 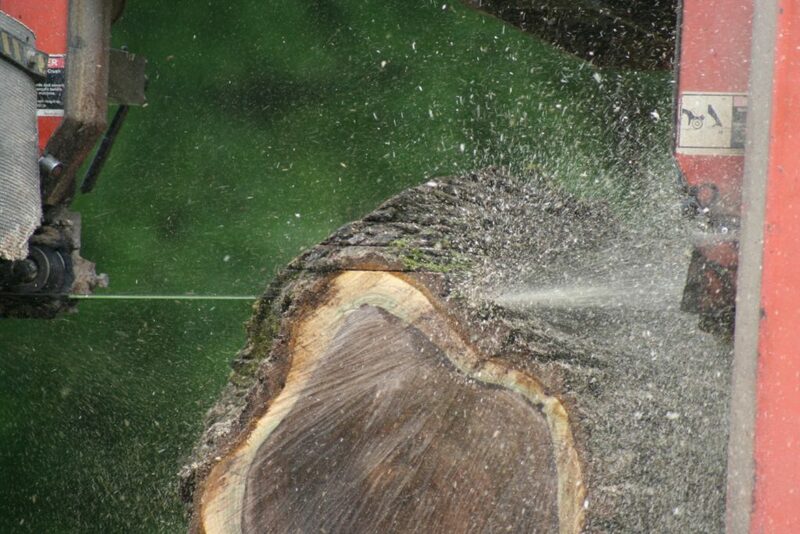 Does anyone else dream of freshly milled lumber? From their own back yard? ….”crickets chirping”…. Well I do! A year and a half ago…I decided on a dream. A huge dream that I knew would never come to fruition. But man I have never loved being so wrong as I do right now. Only minutes ago my dream smacked me in the face and said howdy do! But I am getting ahead of myself. Let’s back up. When we started to seriously consider buying the property we rent, my mind just started blowing up with ideas. So many ideas. Don’t tell Chad, he knows how much my ideas cost. 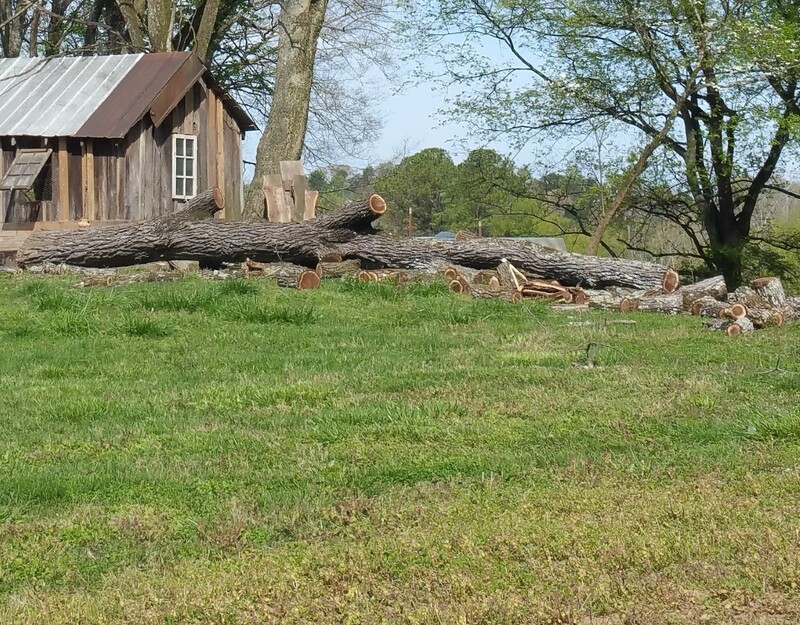 One of my most favoritest, as Autumn would say, ideas was that of taking down a black walnut tree on the corner of our house and making a dining room table out of it. It hung over our chicken coop and would one day hang over our garage addition, so it needed to come down. Luckily we have several other black walnut trees on the property from which to harvest from. I am not going to lie though, I wont miss tripping/slipping on the hundreds of nuts the tree dropped at my back door every year. Several blockades stood in the way of my dream though, bringing it down without taking out our house, how to mill it and um…hello…we didn’t own the property, therefore we didn’t own the tree. Obviously this dream had to wait, and it has. 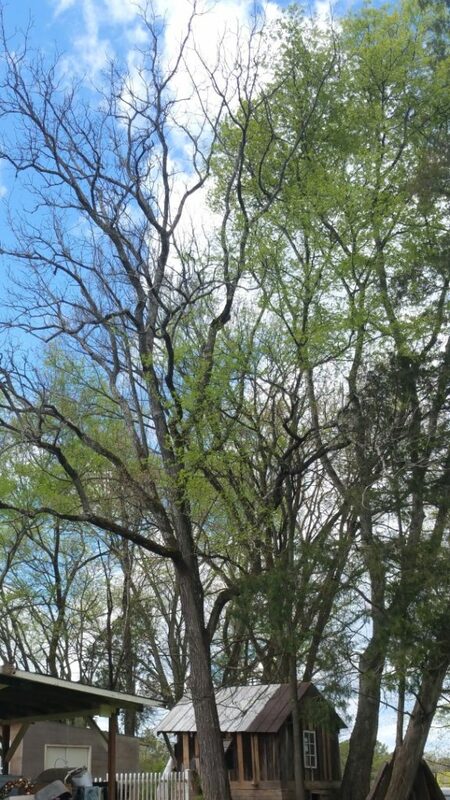 The black walnut is the tree in the center/left side of the picture without leaves yet. At the beginning of the year we started working hard towards getting ready to approach the bank for our home/remodel loan (hopefully good news to come soon). Knowing that a remodel could potentially be in my near future, I asked my brother about taking some trees down around our house when he was in town for a visit in February. I am the lucky sister of a guy who brings trees down for a living. Blockade #1…gone. Joshua pointed out another huge tree on the front corner of the house that was a falling hazard due to water damage. His suggestion was for him to come back in April to take them down before he got into his busy season. Only one problem, we still didn’t own our property. I went to our land lady (she is more of a friend than a land lady), who happens to also be our neighbor. Sherry knew our intentions and gave us her blessing to have the trees taken down. Blockade #2…gone. The last blockade in my way was having it milled, I figured I would worry about that later. Let the tree felling begin! When you have a tree taken down, you just don’t realize the sheer mass of it until it’s laying in your yard. It doesn’t look like much here but this tree is massive. It was around 60 ft tall. I asked Joshua how much he would have charged a customer for this job so I could share with you. Obviously every area/person will have different pricing but just so you can have a ballpark it would have been around $600 to drop this tree. That doesn’t include clean up or hauling off. You can save yourself this expense by cutting the tree down yourself. But if a tree is within falling distance of your house I would highly recommend hiring a professional. I believe $600 is well worth not having to replace your roof. Now to figure out the milling dilemma. I seriously thought we would spend a fortune having the trees milled. But until you call, you never know. 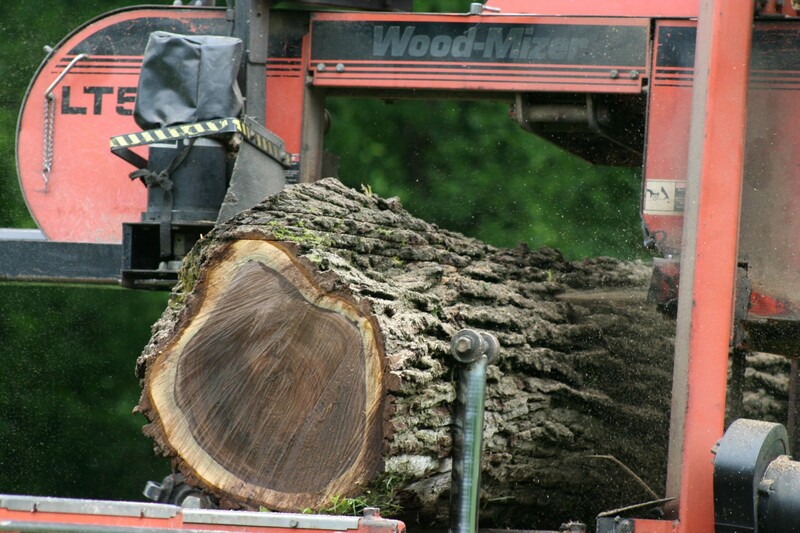 Sherry had used a nice gentleman and his dad with a portable saw mill to have some of her trees milled several years back that we decided to call. Again every area/person will have different pricing but I am going to share our cost just so you have an idea. When Chad called J&J, they had a $250 minimum and that got you up to 1,000 board feet. We had no idea how many board feet we had, Chad guessed around 500, but we assumed at minimum we would be spending $250. Something to keep in mind that I was unaware of, is paying for blades. Every time the blade hits a nail in your tree the blade is ruined. We hit two nails in the black walnut. The blades cost $25 each. In the end we had about 600 board feet between the black walnut and a cedar tree. 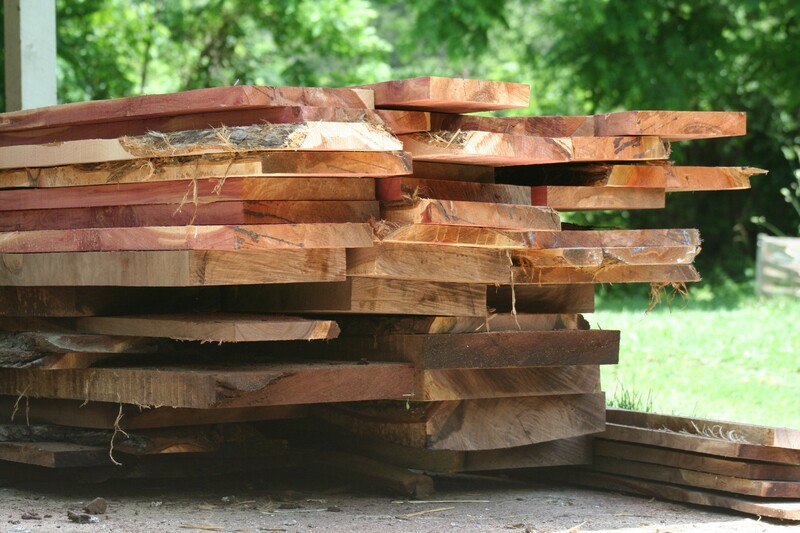 I am not sure exactly why, maybe the guy liked us, or maybe because Chad loaded all the logs and carried all the milled pieces off the machine, but when I wrote the check it was for $235. I was dancing a little jig! There is no way I could ever pay that little for the kind of table I want, let alone be able to say it was from a tree on our property. 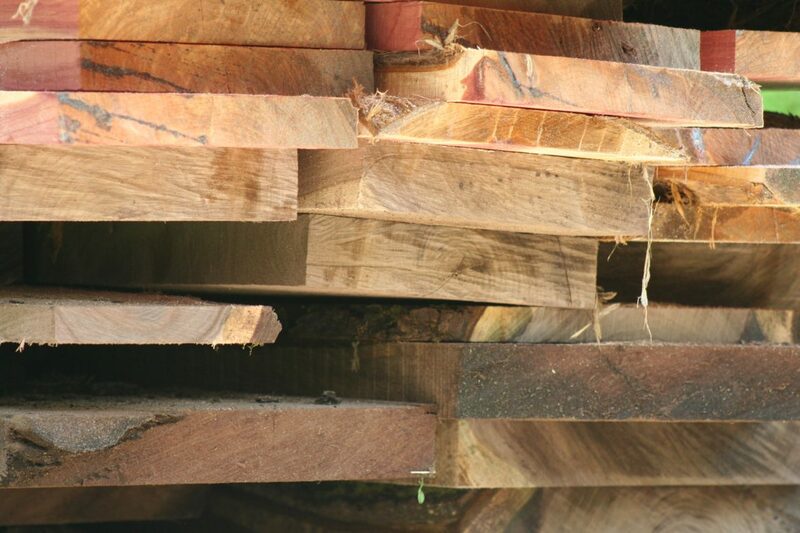 One more expense to keep in mind is a sealant for the ends of your lumber. This helps keep the lumber from checking (where the ends crack from the drying process) as bad. There are really expensive sealants available for this specific purpose, Anchor Seal. Or it was suggested to us to buy returned latex paint for a couple dollars a can at Lowe’s/Home Depot. We will be choosing the later. Obviously we still have several steps to go, we need to paint the ends and stack the boards where they get air flow between them. We are going to use old tobacco sticks in between each layer of boards to get proper air circulation. The rule of thumb is to allow 1 year for every inch thick your board is. Our thickest boards are for the table and they are two inches thick. If you need to speed this process up there are ideas out there with solar kilns that Chad would like to try, but for now air drying is fine. Until we finish the remodel, a huge table would just be in the way for the time being. So we are happy to let the wood sit. I am just so excited to know we are one step closer to the table I have dreamed about for so long. A big thank you to my brother for the awesome job and huge blessing he gave us for only charging for the gas he needed to get here. Without him, this would still be just a dream.